… at least if it’s got some whole grain. 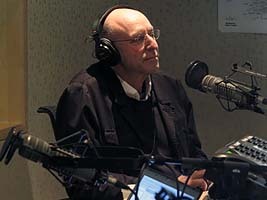 Michael Pollan was on MPR May 2, 2013, with Kerri Miller. Charming guy, you can listen to the interview (click here). He was in town to promote his new book Cooked: A Natural History of Transformation. To our ever-lasting joy, he really focused on bread; that’s where the conversation started. Long-fermented (like ours), and home-baked. We have lots of whole-grain loaves in Healthy Bread In Five Minutes a Day, while most of our white-flour based breads are in Artisan Bread in Five Minutes a Day. Michael, by the way, talked about the value of a little white bread now and then. Everything in moderation, including moderation. I’ve recently moved into a new house and have just baked my first two loaves in this (electric) oven. Can I tell you how excited I was when both loaves crackled and “sang” as they were cooling? I was never able to achieve that at the old house with the gas oven, with or without the pan of water in the bottom. I didn’t even bother with water today, and just heated a cookie sheet in the oven and dumped my loaf along with the baking mat it was rising on right onto it. Perfection! The new edition of Artisan Bread in Five Minutes a Day is available for Pre-Order!